As a climber and photographer for some 20 years, I've had the opportunity to climb on many of the world's great mountains, and visit some amazing places. Mountains are, and have been for a long time, my passion in life. However, for as long as I can remember, I've also had a burning desire to make a positive impact on the world, to do what I can to change lives. And, I've long wondered if there was an effective way I could meld my passion for the mountains with my deep desire to create change. Challenge21 is a direct product of this desire. Over the next 3.5 years, I plan to climb the Triple Seven Summits: the three highest peaks on all seven continents, and 21 peaks in total. And, through the effort, we at Challenge21 hope to make 2.1 million people aware of and engaged in the water and sanitation crises worldwide. Additionally, we aim to raise at least $2.1 million for Water For People, the world leader in dealing with the water and sanitation situation. It's an audacious goal, with a myriad of challenges, risks, obstacles, and pitfalls. But, the goal, I hope, mirrors the magnitude of the crisis faced by much of the world's population, and will bring much-needed attention and funding to the issues at hand. So you've climbed the highest mountain in the world. What's left? It's all downhill from there. You've got to set your sights on something higher than Everest. Challenge21 is about just that: going higher than Everest. – Jake Norton, Challenge21 co-founder, is a climber, photographer, and speaker from Colorado. Internationally acclaimed mountain climber Jake Norton’s climbed some of the most stunning peaks around the world, helped discover the remains of George Mallory on Everest, and guided others to reach the summits of their dreams. Now, Norton’s attempting to do something no climber’s yet done so more people throughout the developing world realize their fervent dream of drinking safe water and having improved sanitation. By summer 2014, Norton’s hoping to be the first to have climbed the Triple Seven Summits, or the three highest peaks on each continent. Along the way, Norton’s using each step to call attention to the close to one billion desperate for safe drinking water and the 2.5 billion without adequate toilets. “I’m hoping to take the visibility of my life’s work and use it to help empower often-invisible people around the world lacking basic human needs. This is really about changing the world around us, and making sure my life and my passion serve more than just me," says Norton, who started climbing at 12 and has done more than 25 expeditions. Norton is convinced that safe water and sanitation are the most pressing global-development issues. “Schools, libraries, computers: these are all great philanthropic efforts. But if people are fetching water all day, they can’t attend school. And if they're dying of water-related illness before they get to the school, library, or computer, nothing has really been gained. Like climbing, we've got to start at the most fundamental level and work our way up, one step at a time." Having already climbed Mt. Everest, Mt. Kilimanjaro, Mt. McKinley, among others in the 21-peak Triple Seven, Norton heads to Africa in August to climb two summits he’s yet to do: Mount Kenya and Mount Stanley. After that, every four to six months, conditions permitting, Norton plans to climb the remaining peaks on his list. The final two expeditions will be K2 in Pakistan scheduled for Summer 2013 and Kanchenjunga in Nepal slated for Spring 2014. All Challenge21 expeditions will be outfitted by Eddie Bauer and First Ascent, one of Norton's sponsors; they will also cover the expeditions through their media channels. The philanthropic goal of the 21-peak expedition is to raise at least $2.1 million and get 2.1 million new people following the project and rallying around the need for safe water and sanitation. The proceeds raised will be dedicated to Water For People’s water and sanitation programs in 10 developing countries, says Norton’s wife and Challenge21 co-founder, Wende Valentine, Water For People’s major gifts officer. Ultimately, Challenge21’s success will not be about marking off a checklist of summits, Norton and Valentine say. Like Water For People’s projects it will be ambitious, but grounded in accountability, partnership, thoughtfulness and commitment. “The goal will be to try to reach all the summits. But if I decide to turn around 20 feet from the summit of a given peak – for safety or other reasons – but still awaken thousands to the water and sanitation crisis, that's success to me," Norton says. For more information, including opportunities to get involved as a sponsor or supporter, please visit the Challenge21 website at www.challenge21.com. 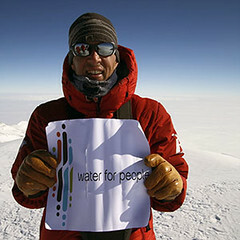 From the famed "Mountains of the Moon" in Uganda to the frigid glaciers of Antarctica, and on to the summit of Mount Everest, professional climber and photographer Jake Norton will soon be embarking on a worldwide quest to draw attention to the water and sanitation situation worldwide. Why mountains? Aside from being his passion, Norton notes: "The great mountains of the world are also essential watersheds for literally millions – if not billions – of people. And, as their glaciers melt and their rivers become increasingly polluted, that has a huge downstream effect on the people that rely on them for their lives." His project – Challenge21, which launches this Earth Day – is an attempt to be the first person to climb the Triple Seven Summits, or the three highest peaks on each of the 7 continents. And, his every effort will be directed toward Water For People. "I've always wanted to fuse my passion in life – climbing mountains – with what I think is most important – changing lives," says Norton. "Challenge21 is the product of this desire, and I'm eager to get climbing and bring awareness and money to the wat-san crisis in general, and Water For People's model and programs in particular." Norton's wife and Challenge21 co-founder, Wende Valentine, is no stranger to Water For People, having worked as a Program Manager and Major Gifts Officer for 8 years. Over the course of 3.5 years, Norton plans to use the visibility of climbing the world's highest peaks to make 2.1 million people aware of the water and sanitation issues worldwide, and to raise at least $2.1 million for Water For People. "Accountability and a sustainable, effective model is what I look for, and Water For People does it all better than anyone else," Norton says. The expeditions, which will begin this summer in Uganda, will be outfitted by Eddie Bauer & First Ascent, one of Norton's sponsors. Learn more about Challenge21, and get involved on their website: www.challenge21.com. Jake, you continue to inspire! This is a wonderful endeavour and a challenging adventure indeed! We will be along in spirit with every step. I will ensure to soon add a link as well to my blog under ‘Giving Back’.